The line is Marabella. 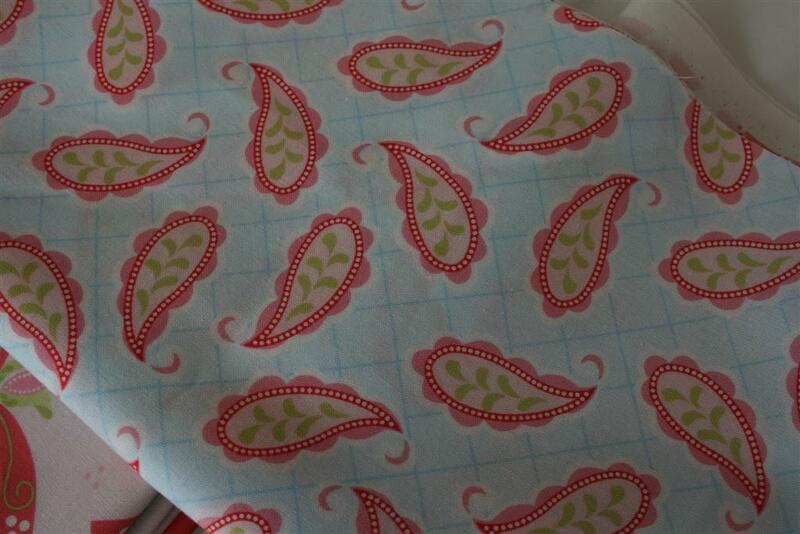 It’s designed by Amy Hamberlin of Kati Cupcake Designs, for Henry Glass Fabrics. It also comes in a purple colorway. You can see all of the swatches here. The purple colorway is very cute. I’m just not drawn to purple. I remember that for a time it was my favorite color as a little girl, so perhaps I’m bound to love it again someday. For now, though, purple is rarely my color of choice. It’s been that way for years. This line doesn’t have as many different prints or colorways as many other lines do, but what I’ve discovered is that a lot of these prints actually look really good with some of the Nicey Jane line by Heather Bailey (think hop dot, church flowers, slim dandy, and pocketbook patterns). The brighter pinks look great with the Whimsy line by Pillow & Maxfield (pink colorway) which I fell in love with last summer. 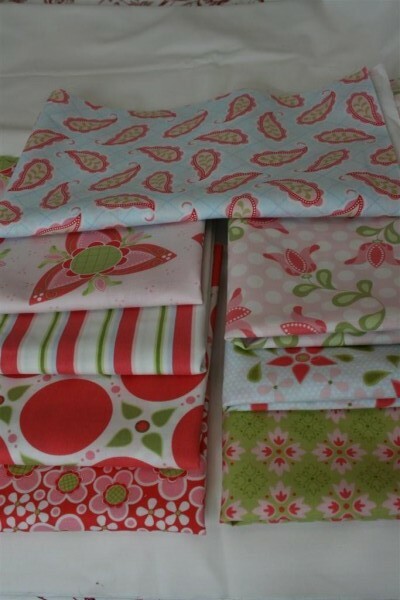 For me, these are great fabrics to throw in the mix and to help me pull together another project with scraps from other lines. This pink polka dot with whimsical tulips is one of my favorite prints in the line. My other favorite is the blue with paisley prints. I’ve come to the realization that my choice in fabric is very predictable. I like a lot of light colors in very bright, fresh colors. I’m particularly drawn to blues, greens and pinks. Something about them just makes me happy. Oh well, I guess we’ll just keep the happiness coming! oh I love this. I noticed that she has some really cute quilt patterns too. I might “need” some of this! I would like to know where i can find your Marabella fabrics near my home near Grand Rapids Michigan. 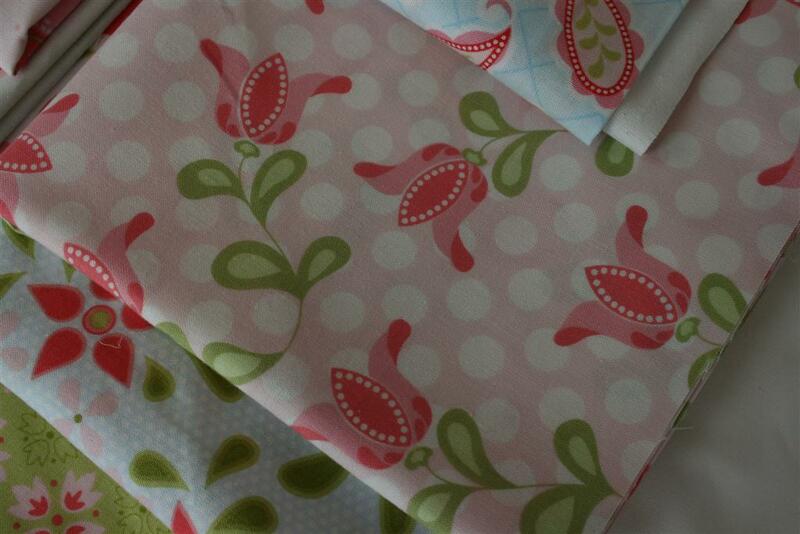 I would like to make a quilt for my grand-daughter in the pink tones. Barbara, These fabrics aren’t my design; I merely purchased them to sew with. The collection was released about a year ago, and I have no idea where you would find them now. My best suggestion would be to begin searching for them online and see if you can find a print here and a print there to get enough for the quilt you like. 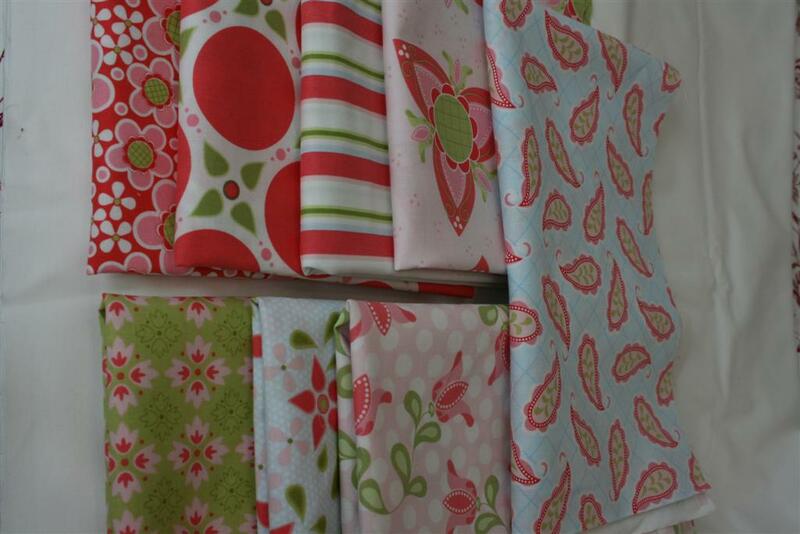 You might also find that there are fabrics currently available that you like just as much if can’t find the Marabella collection. Good luck!